CGST - (Circular No. 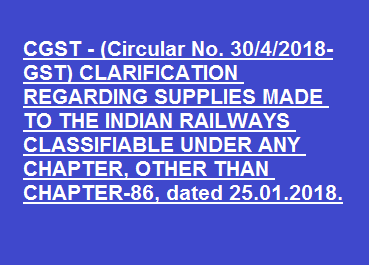 30/4/2018-GST) CLARIFICATION REGARDING SUPPLIES MADE TO THE INDIAN RAILWAYS CLASSIFIABLE UNDER ANY CHAPTER, OTHER THAN CHAPTER-86, dated 25.01.2018. Representations have been received that certain suppliers are making supplies to the railways of items classifiable under any chapter other than chapter 86, charging the GST rate of 5%. The matter has been examined. Vide notification No. 1/2017-Central Tax (Rate) dated 28th June, 2017, read with notification No. 5/2017-Central Tax (Rate) dated 28th June, 2017, goods classifiable under Chapter 86 are subjected to 5% GST rate with no refund of un-utilised input tax credit (ITC). Goods classifiable in any other chapter attract the applicable GST, as specified under notification No. 1/2017-Central Tax (Rate) dated 28th June, 2017 or notification No. 2/2017-Central Tax (Rate) dated 28th June, 2017. The GST Council during its 25th meeting held on 18th January, 2018, discussed this issue and recorded that a clarification regarding applicable GST rates on various supplies made to the Indian Railways may be issued.